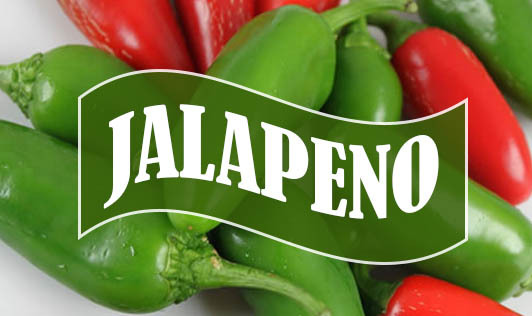 Jalapeno is a fruit, a medium to large-sized chili pepper with a warm, burning sensation when eaten. A member of the capsicum family, jalapeño chillies range from moderately to very hot. Capsaicin is the substance that gives jalapeño peppers their heat. The peppers can be eaten green or red and are available year-round. The thick fleshed, red ripe jalapeño is sweeter than the immature green. Jalapeno peppers should be firm, smooth-skinned and have solid green coloring. Dry lines are not a blemish. They are signs of a mature pepper and indicate hotness. Avoid product that is soft, bruised, has wrinkled skin or spots of mold. Fresh jalapeño should be kept in a perforated bag in the fridge - they'll last for around 2 weeks. As with most chilies, the heat is concentrated in the seeds and ribs. Remove all or some of these parts to lessen the heat. Jalapenos have a nice blend of heat and richest flavor. • Used in pizza, nachos, salsas, soups, stews, meat, vegetable dishes, appetizers and desserts. • Used to make jellies and pickles. • Used as a condiment. Jalapenos are a great source of iron, magnesium, niacin, phosphorus and riboflavin and an excellent source of dietary fiber, vitamin A, vitamin C, vitamin K, thiamin, vitamin B6 and folate. All hot chili peppers contain phytochemicals known collectively as capsaicinoids. Capsaicin is a safe and effective analgesic agent. Yet, moderation is the key word to be kept in mind while using these hot chillies! !